The Sega Race TV Twin Arcade Driving Machine is a racing video game with a distinctly American theme. The game runs on the Lindbergh system hardware, and allows two players to race together across five different courses. The cabinet uses 29" monitors and courses available are Sunshine Coast, Jake's World, Sunshine World, Slip Circuit and a Hidden Stage. There are 8 characters available as well as one special extra timed release. Sega Race TV features a single race mode, and the ability to race other opponents. In the single race mode, the player races through three laps of the selected course, with the player advancing to the following course if they finish within the stipulated ranking. When single play is cleared, a player is given a password. The password opens access to the customization area, where players can customize their vehicle with options including a new paint job. The cabinet has a boost button beneath the gear shift, with players collecting boosts to fill the boost gauge. When the boost button is pressed, the car accelerates at a tremendous speed, with the sudden burst of speed crucial in defeating your opponents. There are also free boost periods, where the player can use boost as much as they like for a limited time. There are 9 licensed cars available, including Ford, Chevrolet, Mazda, Chrysler and Mitsubishi makes. 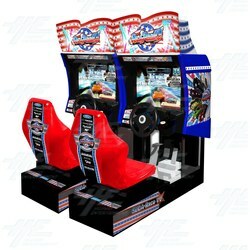 The Sega Race TV Twin Arcade Driving Machine is a racing video game with a distinctly American theme. The game runs on the Lindbergh system hardware, and allows two players to race together across five different courses. The cabinet uses 29" monitors and courses available are Sunshine Coast, Jake's World, Sunshine World, Slip Circuit and a Hidden Stage. There are 8 characters available as well as one special extra timed release. Sega Race TV features a single race mode, and the ability to race other opponents. In the single race mode, the player races through three laps of the selected course, with the player advancing to the following course if they finish within the stipulated ranking. When single play is cleared, a player is given a password. The password opens access to the customization area, where players can customize their vehicle with options including a new paint job. The cabinet has a boost button beneath the gear shift, with players collecting boosts to fill the boost gauge. When the boost button is pressed, the car accelerates at a tremendous speed, with the sudden burst of speed crucial in defeating your opponents. There are also free boost periods, where the player can use boost as much as they like for a limited time. There are 9 licensed cars available, including Ford, Chevrolet, Mazda, Chrysler and Mitsubishi makes. Sega Race TV is a quirky arcade racing game released by... you guessed it, Sega. Up to four Sega Race TV arcade machines may be linked for multiplayer gameplay. This video, captured straight from a Sega Race TV arcade gameboard, shows the video that plays when the machine is in 'attract' mode. Sega Race TV is an arcade racing game developed by (you guessed it) Sega. This video, captured straight from the gameboard of the arcade racing game, is a full playthrough of all five race courses. The video also demonstrates the password system that acts as an incentive to have players replay the game with an upgraded car. Sega Race TV is a quirky arcade racing game released by... you guessed it, Sega. Up to four Sega Race TV arcade machines may be linked for multiplayer gameplay. This video, captured straight from a Sega Race TV arcade gameboard, shows a three race playthrough of the game, including the 'Rumbling Volcano,' 'Jake's World' and 'Slip Circuit' race tracks. Sega Race TV is a quirky arcade racing game released by... you guessed it, Sega. Up to four Sega Race TV arcade machines may be linked for multiplayer gameplay. This video, captured straight from a Sega Race TV arcade gameboard, shows a two race playthrough of the game, including the Sunshine Coast and RTV Arena race courses.